has created the Sakura collection. Three cherry blossoms at the centre of a pink sapphire, artfully engraved on a DELANCE watch symbolize a bit of everlasting spring for this feminine timekeeper. Through the radiant white mother-of-pearl and the elegant bracelet “gourmette”, the DELANCE Kanon will assist you in this connection and will remind you to be all you can be. Delicately engraved with a cherry branch, this DELANCE “Miva” timepiece has been created for a sensitive woman with sophisticated elegance and refined taste. Created for a refined and elegant individual who is happy to be a woman, this DELANCE “Miyuki” watch reflects her personal harmony.An ode to spring, love, and success, two cherry branches enhanced by eight pink sapphires, artistically bring life to this jewellery timepiece. Unknowingly, it subtly attracts the tender regard of the woman who wears it.The soft spring breeze gently scatters five cherry blossoms with a pink sapphire heart on this gentle gold DELANCE “Sakie” watch. A branch of blossoms enhanced by ten pink sapphires captivates the woman who chooses this delicately engraved and gem-set DELANCE “Yuka” watch. The ruby at six o’clock gracefully echoes the sapphires, in total harmony. 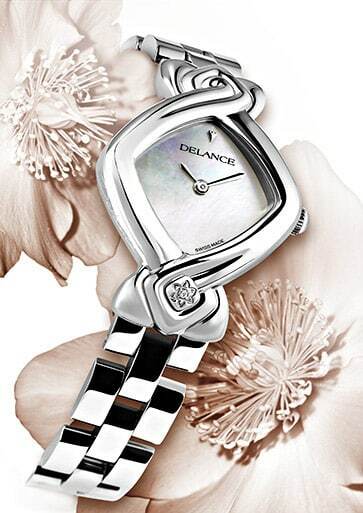 Delicate perfume, fragrance of Japan this highly symbolic and subtle jewel, this DELANCE “Waka” watch captures the heart of the woman who selects it.